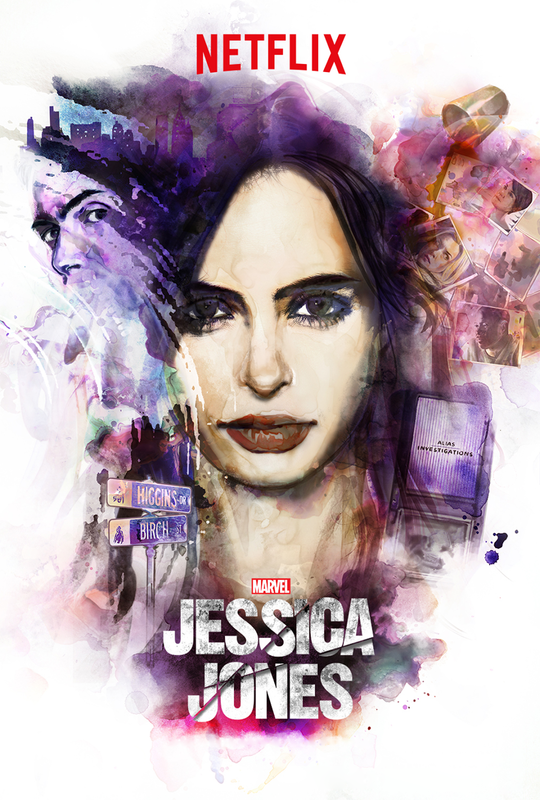 Jessica Jones must answer questions from Detective Oscar Clemons, who is investigating Hope's murder of her parents. Jessica is honest about being hired to find Hope but omits the mind control powers of Kilgrave and her prior relationship with him. Clemons went into Jessica's apartment and enquires about her photos of Luke Cage but she has nothing more to say to him and he cannot legally force her to stay at the station so she leaves. She heads to Luke's bar where he finished being questioned by police officers. She tries to explain what has happened to Luke but he wants to know why she took pictures of him. He knows she took pictures of him and she claims to have been hired by a woman's husband who suspected that his wife was cheating on him with Luke. Luke was unaware that the woman (Gina) he was seeing was married, as he never would've knowingly gotten involved in drama. Jessica is sorry for having cause trouble for Luke but he tells her to leave. After returning back to her apartment, Jessica ponders how Kilgrave managed to cheat death. Jessica visits Hope in jail and questions her about Kilgrave, intent on tracking him down and determining what his plans are. Hope shares how Kilgrave used to make her jump as high as she could for hours, as the long jump was one of her main events in school. Kilgrave always compared Hope to Jessica and Hope is overcome knowing that her brother is now alone. Hope stars that Kilgrave wants to make Jessica suffer for leaving him to die. Hope tells Jessica she should kill herself and Jessica reminds her that she's the only that knows Hope is innocent. Jessica visits Jeri Hogarth and pushes her to take Hope's case and represent her. Jeri is skeptical about Jessica's tales of mind control and doesn't want to take on a case that will lose. Jessica promises Jeri she'll owe her favor if she agrees to take on Hope's case and Jeri seems to reluctantly agree on the condition that Jessica prove Kilgrave's mind control is real. Meanwhile Jeri's assistant/lover Pam informs her that she needs to talk to her wife because she knows about the affair. Jessica's sister Trish tracks her down and is insistent that they talk. When Trish comes back to Jessica's place she is concerned about the broken door. Jessica fills Trish in about Kilgrave being alive and wanting to come after Jessica. Trish doesn't want to see Jessica fall victim to his mind control again but Jessica assures her that she would die before letting that happen again. Trish wants Jessica to be safe but Jessica knows that Kilgrave could send anyone after her at any time so she wants to take this fight on alone to keep Trish from ending up as collateral damage. Gina visits Luke Cage, who tells her he doesn't want to continue their relationship now that he knows she is married. He also tells her that her husband hired Jessica Jones to investigate him, shocking her since thought he didn't know about her affair. She leaves in a hurry to confront him. Jessica sorts through some newspaper clippings of hers about a bus accident and the death of a woman named Reva Connors, the same woman whose photograph was in Luke Cage's mirror. Her concentration is disrupted by more thumping and yelling from the apartment above hers so she goes upstairs to confront the neighbors. A man opens the door while keeping the chain lock on and she tells him to shut up, but then a woman in the apartment begins yelling at Jessica aggressively while the man remains more quiet and easy-going about the encounter. When the woman tells Jessica to go to hell, Jessica breaks through the chain, pulls the woman into the hallway and holds her against the wall by the throat, telling her to keep the noise down. Jessica has a flashback of having blood on her hands and walking away from Kilgrave, who is screaming at her to come back to him. He follows her into the street and then gets hit by a bus. She returns to the place where Kilgrave was hit and tracks down the nearest hospital. She gets a call from Trish which she sends to voicemail, steals a pair of scrubs, and gets into the hospital system to track down the ambulance driver that had picked Kilgrave up after his accident. Jessica attacks a man with some tools at her apartment but stops and apologises when she finds out Trish had sent him to fix her door. She gets into an argument with Trish, upset that Trish is injecting herself into Jessica's life. Trish also has some marks and bruises on her arms and her assistant advises her to put her blazer on to hide them from her boss. Trish is prepared to pay the man's medical bills to ensure he doesn't press charges against Jessica for the assault but hangs up when Jessica lashes out by comparing Trish to her mother. The man from upstairs apologises to Jessica for his fraternal twin sister Robyn's behaviour and is in awe of Jessica's strength. His overall demeanor suggests that he's harmless, even if Jessica didn't have superhuman strength. Later, Jessica smashes a subway window when she has a flashback of Kilgrave yelling at her. Jessica reaches Jack Denton's home, the ambulance driver that picked up Kilgrave. His mother is there and angry at the city for turning their backs on him. Jack was denied worker's comp because he had seemingly stolen the ambulance that night, but Jessica knows that he only must have done so under Kilgrave's order. She is brought inside where a wounded Jack is on a dialysis machine. He suffered a stroke after donating both of his kidney to Kilgrave. He was found nearly dead in an alleyway after losing both of his kidneys and now his mother cares for him. The dialysis machine was donated anonymously so Jessica asks for a glass of water so that she can take a better look at the machine. She snaps some photos of the registry number on it. She speaks to Jack and tells him God didn't do this, but the Devil did, promising to find him. Jack tries to write something out to Jessica. When he first writes the letters "KIL" she thinks he's writing Kilgrave's name and asks if he knows where Kilgrave is. But instead, he writes out that he wants her to kill him. He is upset that she won't put him out his misery but Jessica doesn't want to kill an innocent victim, even out of mercy. Jessica encounters the neighbors in the hallway. Robyn warns her to stay away from her brother Ruben, while Ruben is friendly and says hello. Jessica is visited by Gina, who had confronted her husband about hiring Jessica but since he never did so, all she need up doing was revealing the affair to him. Gina reveals that her husband Andre and friends from his rugby league are heading to Luke's bar to rough him up. Jessica hurries there and observes Luke easily fighting off the men, displaying significant strength. She joins the fight to help him and he is intrigued to observe her super-strength too. Jessica is shocked to see Luke be completely unharmed when one of the men tries to stab him with a broken bottle. As it turns out, Luke Cage has unbreakable skin. He is still annoyed with her though and sends her away, despite his intrigue at her strength. Jessica gets a call the following morning about the dialysis machine. She tracks down the operating doctor that donated it to Jack Denton and shows up to a lecture he is giving, slipping in to sit down in the back. When he observes her, he runs out and Jessica chases after him. Once Jessica catches him, the doctor reveals how he performed the operation on Kilgrave under his command and refused any anesthesia during it, which reveals to Jessica that doing so would've blocked Kilgrave's mind control. He agrees to testify for hope, and Jessica calls Jeri Hogarth so he can recount his experience. Jeri agrees to represent Hope and visits her in prison, telling her that there are other victims of Kilgrave's mind control and asks Hope to tell her story. Jessica calls Trish and the two make up after their argument. Jessica asks to meet for drinks but Trish says she can't because she has a session with her trainer. Trish suggests that they grab lunch later in the week and after finishing her call, is shown to be training rigorously in self-defense which is the cause of her injuries. Kilgrave goes to an apartment and tells the family there he'll be staying their indefinitely. He tells the children to get in the closet and stay there quietly. The parents serve him dinner while Jessica mulls over the latest revelation she has learned about Kilgrave's weakness. She exits her shower and finds Luke Cage waiting for her in bedroom. He says that now they know about each other's abilities. He thinks that she already knew about them before the fight but she says she had only come there to fix things. He pulls out a sandblaster and uses it on his skin, but there isn't a scratch or mark to be seen from it. She moves closer and touches it, awed as Luke tells her he is unbreakable.